Another killer camera app from Nokia on the way? Nokia is apparently plotting a new photography application which would enable users to form 'stories' using their photo albums. 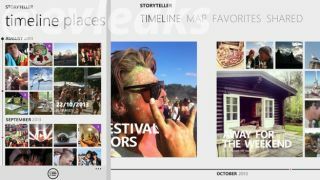 Revealed by serial Twitter leak artist @evleaks this weekend, the so-called 'Storyteller' app for Windows devices will seemingly showcase a Timeline of photos, a Photo Map and albums centred around Events. There's also a Shared tab depicted within the leaked image, which suggests that users will be able to share albums with friends and family, perhaps in a similar way to Apple's Photo Stream tool. The person behind the @evleaks Twitter account, which has been responsible for some high-profile, uncannily accurate leaks in recent times, claims the app will arrive Oct. 22 at Nokia World. That event is also supposedly scheduled to see the launch of a 10.1-inch Windows RT tablet codenamed Sirius as well as the rumoured Nokia Lumia 1520 phablet, codenamed 'Bandit'. The latter of those devices looks like it could be Nokia's most impressive Windows Phone handset yet. Speculation has suggested it'll have a 6-inch screen, 20-megapixel camera and quad-core processor. The Sirius, Nokia's first Windows tablet, faces a tougher task to impress expectant onlookers if it is indeed running the largely derided and largely abandoned Windows RT software for ARM-based devcies. We'll find out for sure at the Nokia World in Abu Dhabi in three weeks time. With a quad-core chip, 6-inch screen, 20-megapixel camera all rumoured, is Nokia going all out with the Lumia 1520?